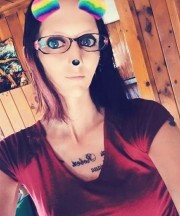 I am a mother of 3 children I like to have fun, hang out with friends, meet new people and make new friends, I have a great personality and great sense of humor, I usually get along with just about anyone, I am not into the whole drama scene so please dont start any or drag me into any becuz im not here for it. I have way better priorities then that which are my kids. .......my kids are ages 12, 15 and 17. I am finally at a time in my life I am completely happy and wouldnt trade it for anything in this world, I recently got my GED in December 2014, and I have been in college online since january of 2015. I was going for my Bachelor's of Science in Information Technology but I just recently changed it to Bachelor's of Science in Criminal Justice. if you ever wanna play a game of backgammon with me plz just let me know.....hope to see some people in games.